AMBASSADOR JOHNSON: Happy Thanksgiving everyone. It is a blessing for the American community to come together in this beautiful cathedral. 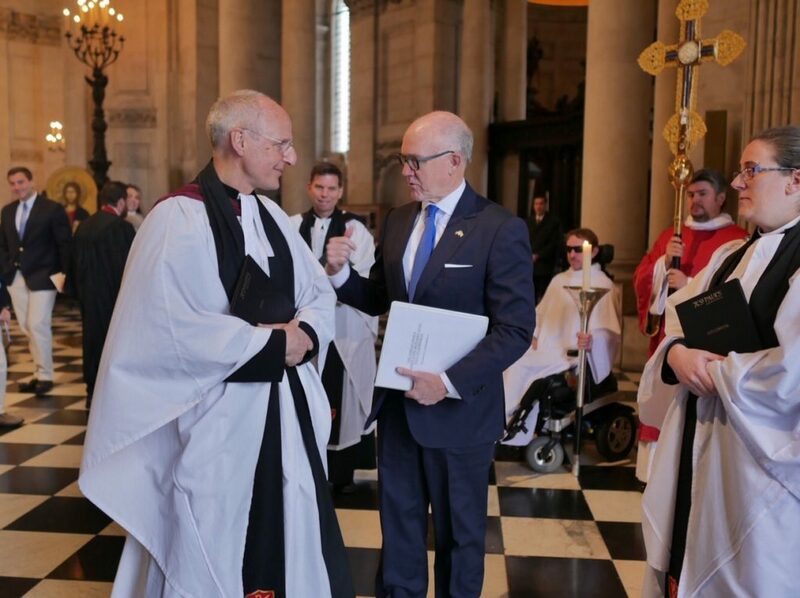 This cathedral is a profound symbol of our incredible bond with the United Kingdom. I saw that again last week on the 60th anniversary of the American memorial chapel. For 60 years, St Paul’s has honored the great sacrifice of our young patriots in the war. And every day, they turn another page in the roll of honor. And bring to light the names of more young Americans who laid down their lives for the liberty we enjoy today. 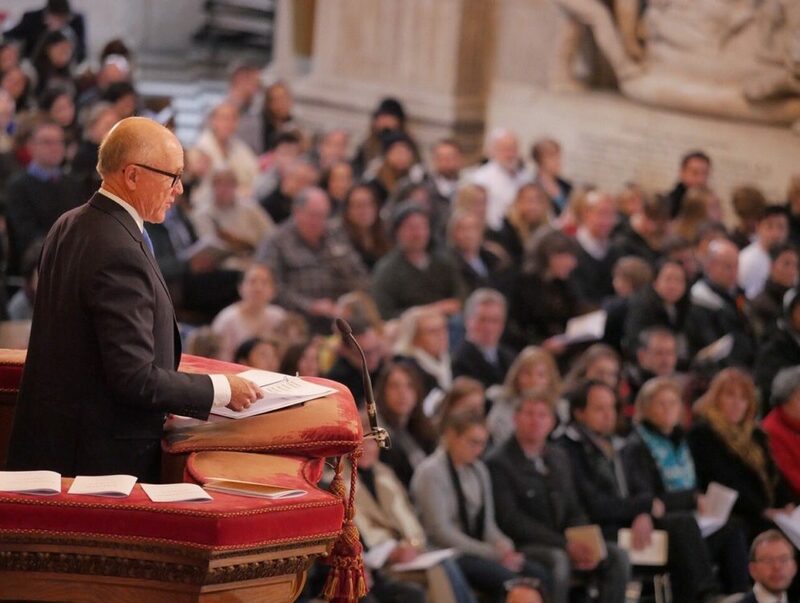 I’m grateful to St Paul’s – and the British people – for keeping their memories alive over all these years. I’m also grateful that every year this cathedral invites us here to worship together on the most special American holiday. It’s the day when we all come together. To share our joy in the good times, our strength in the bad. That is the lesson of the first Thanksgiving. The first year went badly for the pilgrims. If the Wampanoag tribe hadn’t shared a meal with the pilgrims and taught them to farm…they wouldn’t have survived another winter. This year, I have met some truly inspiring people who live by that advice. Like John – a British guy who is a huge fan of Queens Park Rangers, a soccer club in London. When John was 11 years old, he was at a game and he was reading the team program. And in the program, he read a letter from an American soldier in Vietnam. This soldier was a big QPR fan. And he wrote that he missed hearing all the news about Queens Park Rangers. So this young British boy started writing. He sent him clippings from the newspaper. Old programs. And the soldier read these literally in the middle of battle with bullets flying around him. Recently these two met each other – at a QPR game, of course! I sat next to this veteran to watch the game with my two boys. And he told us that those letters had kept him sane. They had given him strength when he needed it most. I saw another example of this last week. A guy called Josh visited us at the embassy. A British guy. The Embassy had sent him on an exchange program to America. And that helped him set up a business in London – fixing mobile phones. That’s not an unusual business. But what is unusual is that he set up this business to help ex-offenders get a job. Not everyone is ready to give people a second chance. But Josh was. It was his entire mission. Had helped him get his life back on track. This year, I’ve been working very closely with a charity called walking with the wounded. 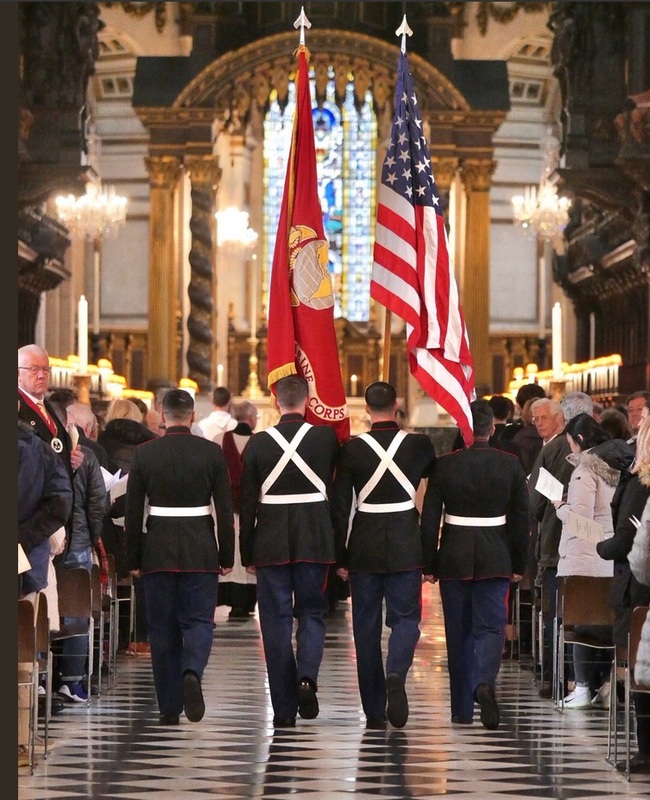 It’s all about British and American veterans recovering together. Because we train together, we fight together, and it shouldn’t stop there. So this charity brought 3 American veterans and 3 British veterans together. And they sent them off on this incredible walk across America. They went from west coast to east. And when we sing America the beautiful later, think about these 6 guys. Think about what they saw on the way. The spacious skies, the amber waves of grain. But think as well about their brotherhood – from sea to shining sea. Every step of that journey, they were raising money for their fellow veterans. They were also raising awareness. Everywhere they went, they spoke openly and bravely about their mental health challenges. And they got an incredible response. People came out on the road to meet them. They threw parties to welcome them. They listened to their stories. They raised money for the cause. So I want to give thanks…to all the inspirational and amazing people I’ve met this year. The people who encourage one another and build each other up. The people who make our countries great. And the people who inspire us all to follow the mission Saint Paul gave us. Who have faced hardship and tragedy this year. And share our time and resources throughout our communities. Or providing words of encouragement. Spreading the spirit of thanksgiving throughout our country and across the world.